Maybank Singapore debit / credit card holder to pay using their card to enjoy this promo. The offer is valid for All Park pass (regular rate) and not applicable with other offers, discounts or promotions. The operation hours may be subject to change without prior notice. Other park rules and regulations apply. 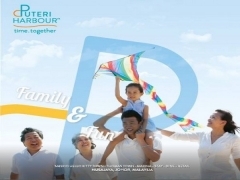 Please visit www.puteriharbour.com for more information. Checkout Puteri Harbour - Playtime for more details about this offer and to book your tickets now!